Derek Ramsay reveals that his parents helped him choose the perfect gift for girlfriend Angelica Panganiban. 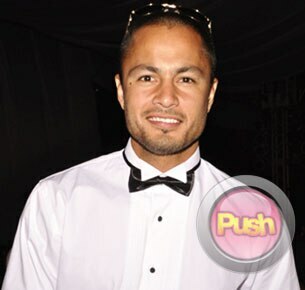 Derek Ramsay merely laughed at rumors that the pair of diamond earrings that he gave Angelica Panganiban for their fourth year anniversary is not genuine. First of all, the dashing star of Magkaribal made sure that the diamonds he purchased were of high quality based on its GIA (Gemological Institute of America) certificate. But since he'rsquo;s not really familiar with such girly stuff, Derek shared that he actually brought his parents along when he chose his anniversary gift to Angelica. "Actually, with the help of my mom who'rsquo;s the professional, I'rsquo;ve learned a lot in the process of buying this gift, yung [kailangan may] GIA certificate, yung mga ganon ganon. My mom and my dad drove all the way down from Tagaytay to Manila just to help me choose a set of earrings for Angel," he said in an interview with Push.com.ph last September 22. When it all comes down to it, Derek stressed that there shouldn'rsquo;t be a big deal about the authenticity of her diamond earrings because it'rsquo;s his effort in finding the perfect gift which matters the most. 'nbsp; "So I don'rsquo;t know where the chismis came about that they're fake. But fake, real or whatever, she's happy with it. It's not naman the cost of the gift eh, it'rsquo;s the thought [that counts]." With regards to Angelica'rsquo;s "hater" who started the whole issue, Derek simply stated, "Like I said you cannot please everybody. 'nbsp; In fact, alam ko na hindi siya peke because there's a certificate. So hayaan na lang natin." On a lighter note, Derek recounted how excited he was when he was planning their anniversary celebration as well as the presentation of his gift for Angelica. As previously reported on PUSH.com.ph, he brought Angelica to Antonio'rsquo;s, Tagaytay for their dinner date together with his parents. Then he gave her the diamond earrings much later. "Muntikan na siyang himatayin. She never expected it so natuwa naman ako sa reaction niya. From her reaction I saw that she's really happy. I'rsquo;ve never gotten her earrings before so yun ang binigay ko," he cheerfully related when asked about Angelica'rsquo;s reaction to his precious gift. But more than anything else, the fact that he shared their love and happiness with his parents really says a lot about the status of their relationship at this point in time. "I mean, kung apat na taon na kayong magkasama, ibang level na talaga 'lsquo;yun e. So for me, if she's a serious girlfriend, pinapakilala ko sa parents ko. It was really a good dinner. Even my parents [were happy that night], my dad texted me, 'I really enjoyed the dinner'. And my parents and Angel get along so it'rsquo;s going very well."